Aluminum Vacuum Technology - Hositrad Holland B.V. 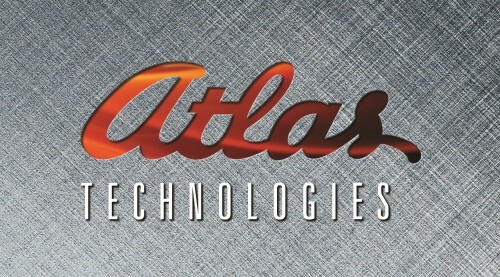 The last 20 years Atlas Technologies has held the position of world leader in aluminum vacuum chambers and components. We pride ourselves on developing new products that better serve our customers, often designing projects and manufacturing products to solve some of the most complicated UHV challenges. The past two decades have provided us with tremendous opportunities in a wide ranging collection of industries from cryogenics to nuclear medicine. We are, at heart, intellectually curious and adventurous. Asking “why?” or “How about this?” is part of our ethos. Tell us what you would like to achieve and we will work with you to make it a reality. 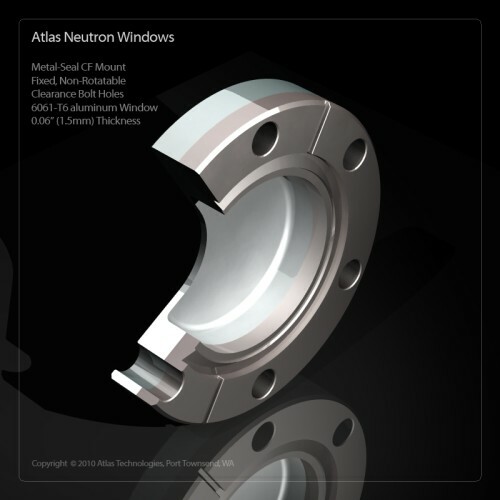 Atlas maintains core strength in dissimilar metal bonding and provides a full range of UHV certified bimetallic components and fittings to demanding applications. Our bimetallic technologies address the most demanding endeavors and aid us in improving functionality, ultimately helping our customers envision and achieve their goals by surpassing the limitations of stainless steel. • Atlas CF Flange™ combines a stainless steel knife edge on an aluminum body so aluminum chambers can be reliably sealed to UHV levels with conventional CF flanges. • Atlas ATCR™, the aluminum face seal fitting with a stainless face, welds to aluminum tubing for delivery of high purity fluid, gas, or vacuum and is the only robust all metal seal for aluminum tube or pipe. 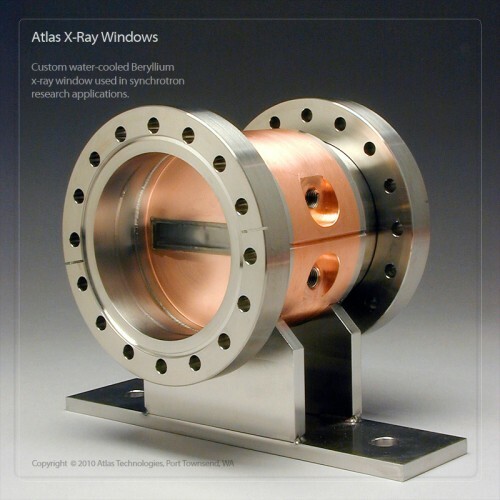 • Atlas Foil Window Flange™ is an ultra thin aluminum or titanium UHV window that allows for quick, inexpensive replacement in the field and is an excellent alternative to beryllium. • Atlas Emissivac™ UHV Polish entails a process which produces highly polished aluminum surfaces that are UHV and extreme high vacuum (XHV) compatible. The resulting surface has considerably lower thermal emissivity, diffusion rates, and outgassing. • The Atlas Titanium Sublimation Pump delivers very low hydrogen permeation, high surface vacuum environment for condensation, and quick pump down. • Atlas Bimetal Tube and Pipe Transition Couplings are metallurgical bonded dissimilar metal joints used to provide an all welded transition for dissimilar metal tubes or pipes for cryogenics, Ultra High Vacuum (UHV), and Ultra High Purity (UHP) environments in scientific, medical, oil and gas, chemical, nuclear and semiconductor industries. • Oxygen resistant and highly thermally uniform wafer heater tables with a hastalloy, stainless, or aluminum face and a copper core to increase thermal uniformity of the surface of the heater. These products and methods have been used on tens of thousands of UHV, semiconductor, particle physics, and cryogenic applications world-wide. Atlas applies innovation to these crucial processes, delivers superior results that advance industry standards, and provides a stable platform of products. Atlas Titanium vacuum chambers offer extreme vacuum performance with very low hydrogen permeation rates and secondary gasses. Titanium vacuum chambers, due to the gettering properties of this metal, are in many ways the ultimate vacuum material. For extreme high vacuum, Titanium is often the best choice. However, due to its cost and slow machining it is typically used only when extreme high vacuum is required. Demountable CF flange sealing to Titanium vacuum chambers is not a problem. Atlas manufactures Titanium Atlas Flanges which have a stainless steel sealing face on a Titanium body. The stainless face matches the coefficient of thermal expansion of other stainless flanges while the Titanium body is welded to the Titanium chamber. Copper vacuum chambers and copper alloy vacuum chambers can offer excellent performance for nonmagnetic, radio frequency (RF), and high thermal conductivity applications. Many of the advantages for Aluminum chambers also apply to copper vacuum chambers. Copper vacuum vessels can be extruded, have very little photo-desorption, have good thermal stability, are self shielding for some radiation and have low thermal expansion. Any single physical or chemical property of aluminum may be enough reason to select aluminum as a vacuum chamber choice over stainless steel. Aluminum has seven orders of magnitude less hydrogen than stainless steel. It has very low levels of Carbon, resulting in significantly less H2O, CO, C2 and CH4 than stainless steel. 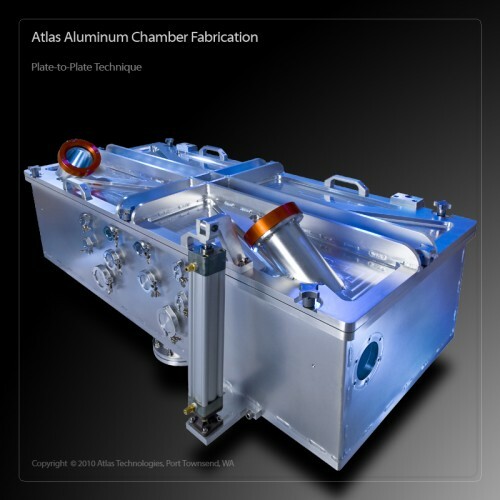 Once baked, Atlas' aluminum vacuum chambers generally cycle to high vacuum and ultra high vacuum levels faster and require less pumping than stainless steel chambers. In addition, they bake-out faster and more uniformly even at lower temperatures (150 C). 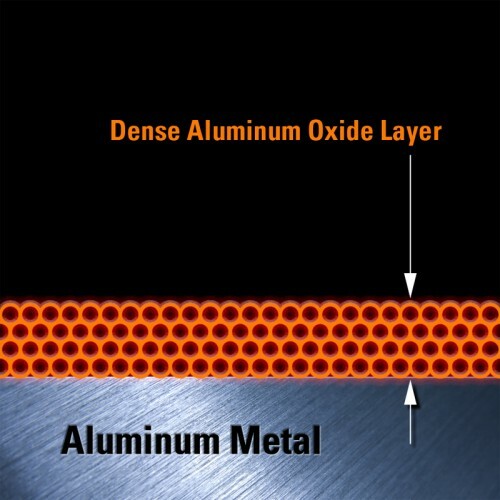 This is due to aluminum's high thermal conductivity (10x that of stainless steel). 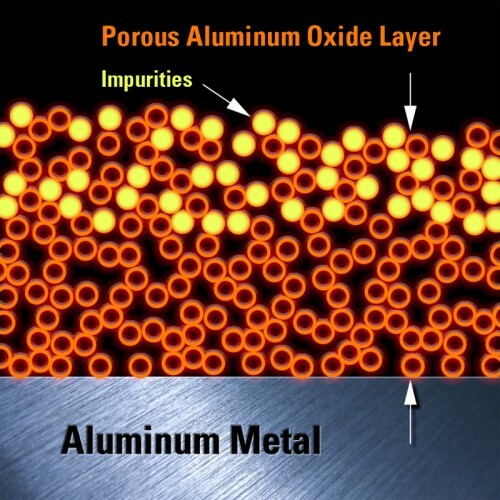 Aluminum is produced with a heavy mill scale and rough (porous) oxide layer a surface not well suited for vacuum, because it absorbs water vapor and other contaminants. After removing this rough layer Atlas cleans all metal surfaces before, during and upon comple-ting the fabrication process. Atlas' advanced vacuum surface passi-vation process replaces thick porous oxide layers with a quality thin and dense oxide surface. Atlas' proprietary specification establishes a standard for the creation of dense oxide surface passivation. Treating aluminum in this manner effectively reduces surface area, contamination and desorption. Fluorine gas is a common cleaning agent in aluminum chambers. Atlas aluminum chambers and gas delivery lines are far more resistive to fluorine than those made of stainless steel, because Atlas' AVSP-08 process forms a dense protective oxide layer that make our aluminum a highly corrosion resistant material. These surfaces can be further protected from halogens by producing even thicker and harder oxide layers through an electrolytic anodizing process. allow full bakeout at 150°C — much lower than stainless. Aluminum chambers heat up quickly and uniformly, bakeouts are faster and more complete with significantly reduced cycle times. With low nuclear activation, aluminum has a short neutron activated half-life measured on a scale of hours—significant when compared to stainless steel’s scale, which is measured in thousands of years. This offers huge disposal savings and a priceless reduction in potential exposure to staff. Aluminum is essentially magnetically transparent (non-magnetic). An aluminum UHV chamber’s low magnetic permeability offers no measurable disruption to electron and ion optics. With a low Young’s’ modulus (69GPa) of elasticity (1/3 that of stainless steel, 207GPa) aluminum offers outstanding vibration dampening, making it the material of choice for precision synchrotron, semiconductor and physics applications where excess vibration can have disastrous consequences. Because of its superb machinability (5x to 10x faster than stainless) aluminum chambers can be manufactured with more detail. Aluminum can also be cut, shaped or formed, and extruded quite easily. Chamber features are produced to fit an application rather than tailoring an application to fit a material’s manufacturability limitations—reducing extra equipment and space. Atlas offers five basic aluminum chamber types... monocoque, plate, tube, extruded and formed aluminum configurations, to give you a variety of design options and complete control of your application. volume and surface area; fast cycling, bakeout and pump-down times; reduced footprint and smaller /lighter support structures; reduced shipping cost; and lower disposal costs when dealing with nuclear activation applications. Even to experienced welders, the welding of aluminum to vacuum standards is a challenge many are not capable of achieving. The welding process can introduce porous oxides that impede hermitic welding. In other industries these welds can meet mechanical standards, but when tested to vacuum helium leak standards are considered inadequate. Atlas aluminum vacuum welds are quite distinctive from conventional aluminum welds. They are more continuous, have a ‘glassy’ surface and minimized area. Atlas' AT-AVW process reduces internal and external oxide inclusions, effectively eliminating leak paths or virtual leak pores—essential to good vacuum performance. Typically the AT-AVW process produces a smaller heat affected zone, which leads to less surface haze and contamination. and Technology A 3. p. 2188.